Tucked somewhere in old, old papers from my school days, is a collection of poetry that I memorized for extra credit. Today it seems well, old-school, but while our education system seems to emphasize memorized facts, we've lost the art of memorization as knowledge, as an art. While I can't claim that can recite those poems of my youth, I value the skill set learning how to memorize. That the techniques of memorization so fully unlock the levels of a poem was one concept that presented itself in this book. With poems short and long, silly and serious, concrete and surreal, she's brought together a collection that expands the idea of a "children's poetry book" to something that will be shared with an adult with equal interest. Emberly's illustrations are a perfect fit with this concept, with styles adaptable to lighter or serious verse, showing humor, sensitivity, and a gentle touch that complements the text. Wonderful book for a classroom - think teacher gift! - or to read at home. 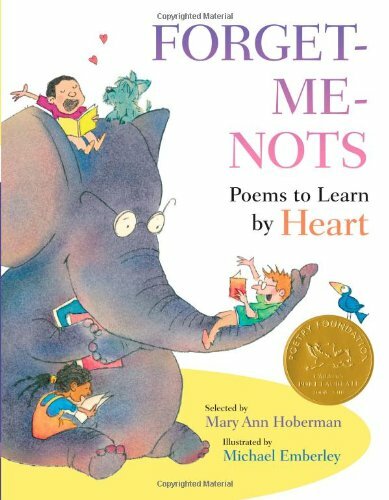 For more poetry books and poems, Poetry Friday is hosted today at Think Kid, Think!